If we are to achieve our ambitious sustainability goals, then everyone in the ASU community has to step up and do his or her part,” says Nick Brown, director of sustainability practices, Arizona State University, Tempe. As home to higher education’s first school of sustainability, the university is already well-versed in achieving sustainability learning outcomes with our more than 76,000 students. Engaging with more than 12,000 faculty and staff, however, requires a different approach. Sustainable practices in action at ASU. Ways staff can support ASU’s sustainability vision. Steps individuals can take to excel in the sustainability criteria related to their annual performance evaluation. Launched in February 2011, the literacy program consists of tutorials that include photos and accompanying audio messaging. Taking about an hour to complete, the online process fits easily into employees’ daily work schedules, allowing them to stop at any time and then log back in to resume. An overview of ASU’s sustainability mission kicks off the literacy program: “promoting a healthy, robust society through the interconnectedness of environmental, economic, and social systems that balance the use of natural resources for present and future generations.” This is followed by information about ASU’s four sustainability goals: carbon neutrality, zero solid and water waste, active engagement, and principled practice. Employees study five lessons, answer a three-question sustainability quiz after each one, and may repeat the course until they reach their desired score. 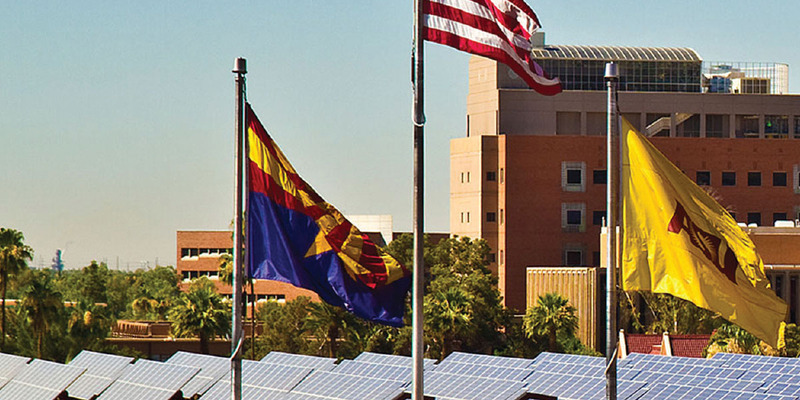 ASU extends sustainability education to employees, with an online interactive program. Upon program completion, employees receive an electronic certificate that can be e-mailed to their supervisors. “There are more than 88,000 change agents in our university community, and each of them has a role to play,” Brown says. “But you cannot be a great actor unless you have a great script.” The program is recommended for all new employees. To date, more than 2,200 employees have earned their completion certificates. The literacy program also assists employees in meeting job performance standards, while supporting ASU’s goals. Beginning in January 2008, university staff members’ yearly performance evaluations included a section about their contributions to sustainability practices. The following year, supervisors began rating employees on such work. “The literacy program builds employees’ competency and awareness of what sustainability is and how they can demonstrate their support of the university’s goals,” says Kevin Salcido, associate vice president and chief human resources officer at ASU. The HR office features the program on its Web site and disseminates information about it through its network of business operations managers. To demonstrate sustainable practices during new-employee orientation, reusable cups replace disposable water bottles, and employees enroll for benefits electronically. All subsequent personnel transactions are done online, which greatly reduces paper consumption. Use of compost rather than pesticides for pest management. Subsidized bus and light rail passes for students and employees. Harvesting of 20 varieties of campus-grown citrus and other edibles for the food service program. Use of green cleaning products throughout campus. “The ASU sustainability literacy program supports our corporate sustainability responsibilities and practices. Our sustainability strategy … includes both bold moves and thousands of small steps, and our employees play a key role every day,” notes Morgan R. Olsen, ASU’s executive vice president, treasurer, and CFO.